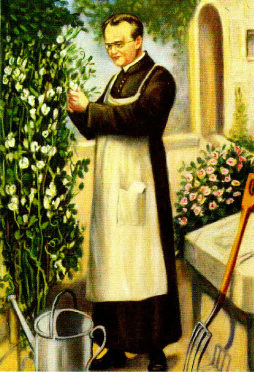 Gregor Mendel is widely credited as being the father of modern genetics. He was an Austrian monk who had studied Physics and Statistics at the university. Upon his return to the monastary, he cared for a large plot of pea plants (among others). Mendel observed that certain traits would appear as distinct features of offspring, closely resembling one parent or another. This he determined that there must be units of inheritance that were passed from parents to offspring, and that a characteristic of the offspring was not simply a blend of the parental traits. He also observed that the offspring could exhibit features that were not evident in either of the parents. Mendel applied his knowledge of statistics to his experimentation with pea plants. He developed plants that were true-breeding for certain characteristics (P generation), then crossed these plants and carefully recorded the traits of the progeny (F1 generation). He then crossed offspring of this first generation and carefully recorded the outcome of these crosses in the second generation (F2 generation). He observed that one variant of a trait would dominate another in the first generation, but would reappear in the second generation. He also observed that this occurred in a predictable pattern. Beige represents the dominant trait, and green recessive. Variants of the same trait are called alleles. For example, a single gene in a plant could be responsible for the color of that plant's flowers. One form of the gene may code for protein that results in red flowers and another form of the gene may code for protein that results in white flowers. Red flowers are the dominant trait in that particular flower population. The allele for red flowers could be expressed with a capital "A", and the allele for white flowers could be expressed with a lower case "a". The likelihood of a certain trait appearing in the offspring of a cross between two parents can be shown with a punnett square. The possible gametes produced by the parents are shown on the outside of the square, and the resultant genotypes of the possible offspring are shown inside the square. The example on the right shows a cross between two parents. Each of the two parents is a plant with red flowers, because they each have the dominant allele. Each parent also carries the recessive allele "a", though it is not expressed in the physical appearance, or phenotype. The offspring will receive one allele from each parent when gametes combine to form a zygote. 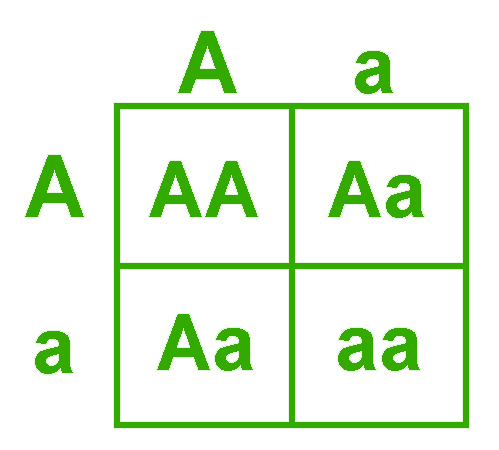 The punnett square shows the ratio of possible combinations of alleles that could result from the cross. A cross between two heterozygous individuals results in a genotypic ratio of 1:2:1 and a phenotypic ratio of 3:1.